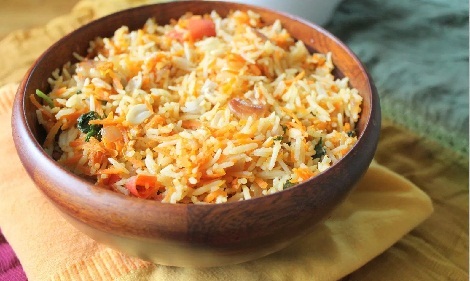 As the first step, soak the basmati rice for 10 minutes and cook it such that the rice grains do not stick to each other. You should be able to sprinkle the rice loosely. Take a deep bottomed pan and heat required amount of oil in it. Once the oil gets heat, sputter some mustard seeds, cumin seeds and curry leaves and red chillies. At this stage, it is optional to add cashew nuts. Once the tempering is done, add two finely chopped onions and saute it in oil. Add a pinch of salt to catalyze the process. Once the onions are partially fried, add grated carrots and fry for a few minutes. You can find the carrots getting nicely cooked and shrinking in size as compared to what was originally added. As the carrots get half cooked, it is time to add the masalas including Sambar powder and garam masala powder. To this, add a string of curry leaves. Now, add the cooked basmati rice. And give it a gentle mix. And your carrot rice is now ready. This can be served with potato chips or crispy Appalam or Pappad.